While it’s easy to dismiss NAB as Nerdy And Boring, it’s worth remembering that unlike CES, it’s flashier cousin, NAB is meant for television engineers and production staff. Hence the seeming overemphasis on dollies and lenses. There wasn’t a whole lot new coming out of this year’s show as much as a confirmation that last year’s trends (4K, the explosion of video content) have become this year’s tried and true. 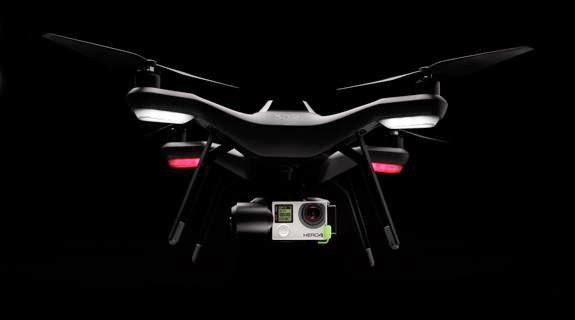 One trend that’s becoming far more mainstream is drone cameras, and the introduction of two high-quality, consumer-priced drone cameras, 3DR’ s Solo and DJI’s Phantom2, seemed poised to usher in a more wide-ranging spread of dronedom. CAT DRONES! Watch for gratuitous drone shots to start popping up all over YouTube (and Vine) as the UGC contingent looks to up its game by shooting cute cats and how-to-change-a-tire videos from a whole new angle. There’s a definite chance for creative uses here, but we think most initial usage will be of the “Hey look! I bought a drone cam!” variety. PAPADRONEZZI: This is the most disturbing use case as paparazzi are likely to begin using drone cameras to enable more effective stalking of their favorite celebrities. They’ll get video as well as stills and if the celeb in question happens to be a good shot, it’s only another $999 to replace one. Drones aside, two other notable stories to emerge from NAB both concerned Adobe Prime Time, the company’s video and advertising management software. The first was the announcement of a partnership between Adobe Prime Time and Akamai. While in some ways this just formalizes something that was already happening, the net effect is to improve Adobe’s server-side ad stitching. So less buffering, more devices and good luck with that ad-blocking software. That gives us hope about the near-term future of OTT TV, as anything that can make that experience feel more like standard-issue linear TV is own going to serve to drive adoption. Adobe’s other announcement was that Crackle TV was going to start running a “live TV” option, where the viewer is immediately served up a program when they open open the app, rather than just viewing a static screen. The trick here is that different viewers will see different (ad-supported) program streams depending on their prior viewing habits. This is notable in that it’s a definite future option for just about any network: show viewers your catalog based on what they want to see, not what you want to show them. We’ll be watching how Crackle’s viewers react to the idea of a live feed, whether they embrace it or reject it as hopelessly old school and how all that affects their ad revenue. All this action from Adobe is a good thing too, in that they are Nielsen’s chosen partner and the activity may indicate that the time is nigh for Nielsen’s long-awaited OTT TV ratings. That about wraps up NAB. Not a whole lot to report, but at a time of rapid change, that may just be a good thing. Is HBO Now The Canary In The Coal Mine?